When you install Net-Ready Eyes, suffer 2 meat damage. Whenever you initiate a run, choose an icebreaker. That icebreaker has +1 strength for the remainder of the run. "Look..look with your special eyes." Seriously though, I love the flavor of these new cybernetic implants. What's more awesome than cutting out bits of your weak human flesh to splice in shiny chrome parts? It's a huge element of cyberpunk that we haven't yet seen (well, maybe Spinal Modem a bit). But about the card itself. The immediate point of comparison is The Personal Touch. They're both 2 influence Shaper cards that give you a +1 strength on an icebreaker. Their basic use is relatively similar; you use them to boost the strength of a fixed-strength breaker like Yog.0, or you use them to make the cost of certain expensive-to-boost breakers like Pipeline or Inti less prohibitive. If nothing else, they saves you a credit on your Corroder per barrier broken, which can add up quickly. Now, what's different? The cost to install is the first part. TPT costs 2 to install, which is typically not a big deal and well worth it if you can then Yog a Lotus Field. 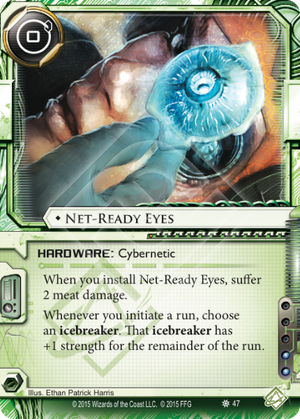 On the other hand, Net-Ready Eyes costs no credits...but hits you with 2 meat damage. Ouch. Make no mistake, this is clearly worse. You are losing two cards (and therefore the clicks you likely used to draw them), and since meat damage in random it's up to fate whether you lose something useless or something useful. On top of that, Net-Ready Eyes is unique, which increases dead draws if you put in more than one. So why would anyone play this? First, your investment is much less likely to go to waste. With TPT, one unlucky hit on a program-trashing ICE might cost you your breaker and the hardware along with it; with NRE, you just shrug and boost a different breaker instead. Second, you can install NRE and your breakers in either order. Lastly, there is a neat synergy with I've Had Worse from Order and Chaos; most net/meat damage occurs when the corp says it does, but this happens at the runner's leisure, so you can hit the shop when the outcome is the best for you. Overall, I don't think this is going to redefine the game, but if a deck is already running strength-boosters like TPT or Dinosaurus it's worth testing this card in place or in addition to a few of them. The first and obvious benefit of this card is in making Yog.0 strong enough to break Lotus Field, but that's not all there is to Net-Ready Eyes. In general, Anarchs do benefit a great deal from splashing this card, since it makes both Mimic, Yog.0, Knight and Morning Star much better. The +1 to the strength is also quite useful for cards like Femme Fatale, Sage or Creeper, which pay 2 to raise their strength, or with all Icebreakers in general if you wanna save some money. Taking 2 meat damage for that might be quite annoying, though, but you can always Chrome Parlor to prevent that and freely install other cybernetics as well, without damaging yourself. Given how their strength depends on the presence of other installed Icebreakers, you would need a lot of them to break stuff like Wormhole or Asteroid Belt. With this card they can always have at least strength 2, which allows to break quite a number of ice. Last but not least, this card might make the Atman based rigs more popular once more, and less dependent on the number of virus counters on your Datasuckers. All in all, Net-Ready Eyes is a simple way to save a lot of money, especially if you're an aggressive runner. Since you chose which Icebreaker will get the bonus strength when initiating the run, you can assign it to different targets each time, adjusting it to your needs. Even if it might make you discard two cards, I'd say it's a pretty good card to have... it will probably see plenty of use.